This week Dr. Harvell and her team at Cornell University confirmed that the surviving sea stars are not resistant and Sea Star Wasting Disease is going strong again this year. If you live in a coastal area with cobble, rocky bench, or tide pool coastal sites and are able to conduct a July sea star survey during low tides, we'd greatly appreciate it. 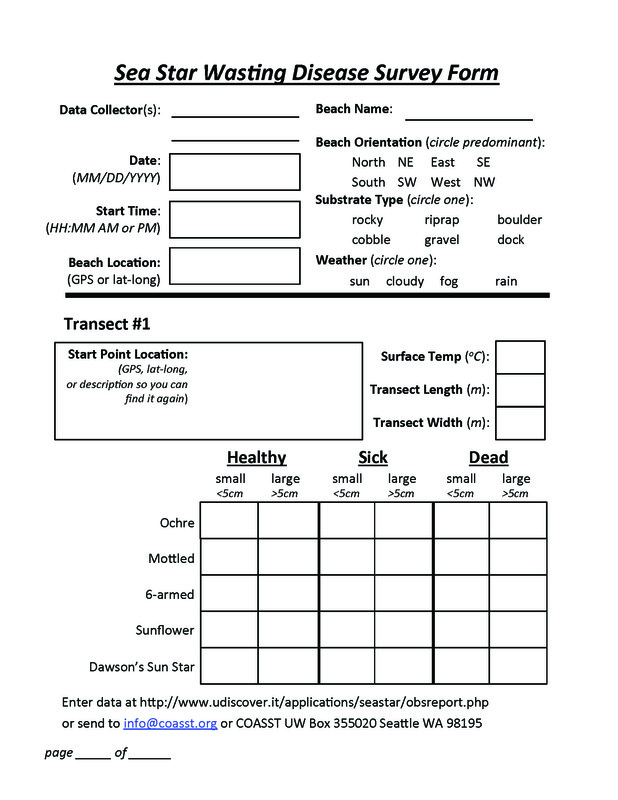 Everything you need to get started is at the bottom of this page - a sea star protocol and a datasheet. Here is a brief update from Dr. Harvell on their most recent surveys in the San Juan Islands at their most populous site, Eastsound. and a brief update on the data compiled as part of the citizen science collaboration with COASST. Quantify the magnitude of mortality from Sea Star Wasting Disease. The focus is largely on the dominant intertidal star, Pisaster ochraceous (Ochre Star), since we have the most data for this species. At some locations in lower Puget Sound and Alaska, the citizen science plot also includes impacts to the mottled star (Evasterias troschelli). Quantify the impact of environmental drivers (largely temperature) on magnitude of the epidemic. 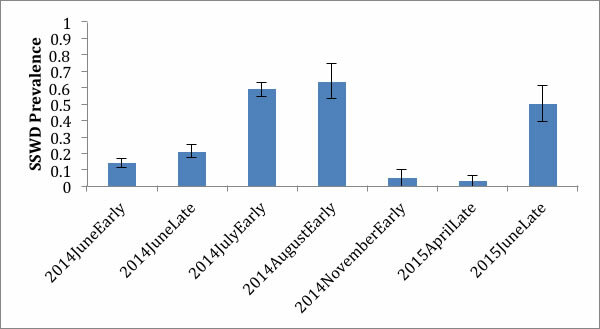 Determine if survivors of the 2014 mortality are resistant to further mortality in 2015. Here is a complete animation of all the data that was successfully reported in 2013, 2014 and beginning to come in for 2015. The animation shows the extreme levels of the epidemic at most locations in the summer of 2014 and the subsequent loss of almost, if not all, stars at many locations (indicated by an x). Please note that these Xs indicate that stars were not abundant enough to be observed at a given time and were sometimes observed in low numbers in later surveys. 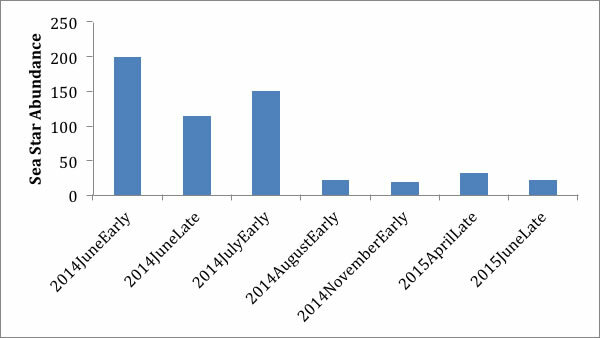 Further analysis of this data is underway to prepare a publication. Dr. Harvell and her team are currently in the San Juan Islands at Friday Harbor Labs. Last year the San Juan Island sea star mass mortality event was between June and August and commenced at warmer locations first. Eastsound had the largest sea star population in the San Juans. As with most of the San Juan populations, 90% of the stars died between last June and August (2014) and there were only 10% remaining in April (2015). Dr. Harvell and her team have been watching the survivors carefully to assess the possibility that they could have developed resistance and be immune to further mortality. In April only 1 star (out of 32 survivors) was sick at Eastsound. On June 16, 50% of the survivors were clearly wasted and the remainder are showing more vague signs like twisting. Results of Surveys at a single site: Eastsound, San Juan Islands, WA: Prevalence is the proportion of infected animals (multiply by 100% to get percentage). Approximately half the surviving 22 stars found most recently in Eastsound have clear Sea Star Wasting Disease (SSWD) lesions. These animations give us a “time-space” view into the fate of one particular species of star, the Ochre star (Pisaster for those of you who are up on your Latin). Open circles with an X are sites where we know stars disappeared. Color indicates how many of the stars at a site were sick; green is the highest percent of healthy stars, ranging to red, or all stars found are sick. Don’t be fooled by the concentration of data in the San Juan Islands – data collection started there in January. In fact, these points were the “early warning” that convinced COASST to get involved. 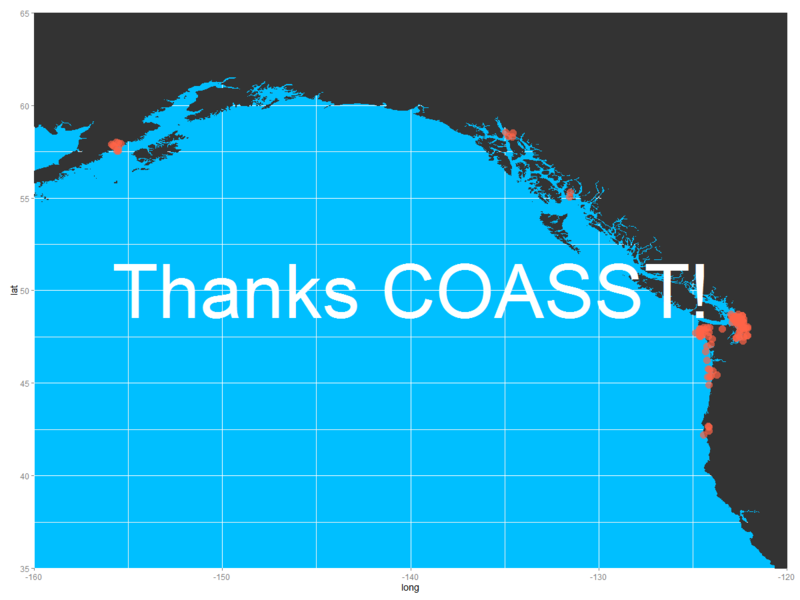 The entire dataset was collected over a huge spatial range and many months – a lot of people contributed, including COASSTers and scientists from Cornell University, University of Puget Sound, University of British Columbia, Olympic National Park, and UCLA. The story is a bleak one – a wide-spread increase in the percentage of diseased stars through August, by which time many sites were devoid of these organisms. Will Ochre stars go locally extinct, or will populations rebound? Only time and continued monitoring at many sites along the coast will tell. The other thing you can see in these animations is the temperature signal of the water. Warm water appears to influence the spread and severity of the disease. Cornell University marine scientist and professor Drew Harvell and her team are working hard to nail down the influence of temperature, even as they and others zero in on identifying the disease agent. They are currently testing the hypothesis that stars were sicker and died at a higher rate at warmer sites. Of special interest is the spread of disease in the Alaska regions – Southeast, Gulf, and Aleutians – as well as the spread to other species. The September tides were not good for monitoring, so the next chance to see where survivors remain is the November low tides this week. If you monitor a beach site that has suitable rocky habitat (rocky bench, tidepools, or boulder and cobble) and are able to make it out for a sea star survey during the November low tide series, we'd love to see your data! Remember that safety comes first! Fall tides are marginal for light levels, so if you do get out there, dress warmly and take a flashlight or head-lamp. If you haven't checked out the sea star protocol yet, you can find it below. 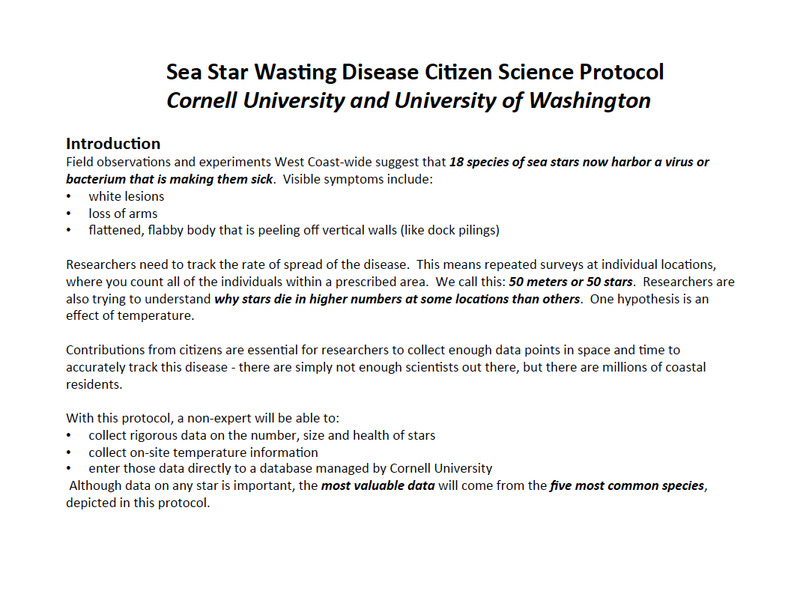 You can also read more about the project on Cornell's sea star website. Any questions? Please let us know, and we would be more than happy to pass them along to Drew and her team. Thank you to all who have conducted sea star surveys. We really appreciate it. If you would like to help or learn more about this important project, please see the COASST sea star protocol and data sheet below.